‘Frankenweenie’ 3D Blu-ray Announced And Detailed!!! Tim Burton’s remake of his own film ‘Frankenweenie’ is coming to Blu-ray and Dvd early next year. I rather enjoyed this new version as I said so in my review HERE. There looks to be some great extras on the disc, so I’d pre-order now if I were you. Official press release below and disc speicifications. Disney and creative genius Tim Burton (creator of “The Nightmare Before Christmas”) proudly announce the home entertainment debut of “Frankenweenie” arriving as a 4-Disc Blu-ray™ Combo Pack, Digital and On Demand—January 8, 2013. A must-add to any Tim Burton collection, the hilarious 3D stop-motion animated masterpiece is filled with quirky characters and unexpected twists. Boasting an electrifying variety of bonus materials, the4-Disc Combo Pack (Blu-ray 3D + Blu-ray + DVD + Digital Copy) includes an all-new original short “Captain Sparky vs The Flying Saucers”; an exciting behind-the-scenes featurette with Tim Burton “Miniatures in Motion: Bringing ‘Frankenweenie’ to Life”; a showcase of the film’s touring exhibit, “‘Frankenweenie’ Touring Exhibit”; Tim Burton’s original live-action short of the same name, and more. “Frankenweenie” features an all-star cast including the voices of Emmy Award®-winner Catherine O’Hara, Tony Award®-winner Martin Short, Academy Award®-winner Martin Landau, Charlie Tahan, Atticus Shaffer, Robert Capron, Conchata Ferrell andGolden Globe®-winner Winona Ryder. From Disney and creative genius Tim Burton (“Alice in Wonderland,” “The Nightmare Before Christmas”) comes the hilarious and offbeat “Frankenweenie,” a heartwarming tale about a boy and his dog. After unexpectedly losing his beloved dog Sparky, young Victor harnesses the power of science to bring his best friend back to life—with just a few minor adjustments. He tries to hide his home-sewn creation, but when Sparky gets out, Victor’s fellow students, teachers and the entire town learn that getting a new ‘leash on life’ can be monstrous. 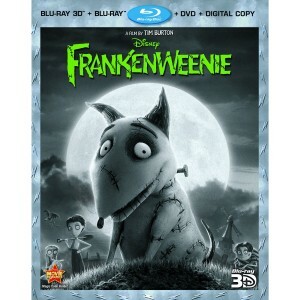 Complete with electrifying bonus features, “Frankenweenie” is alive with enchanting excitement in eye-popping Blu-ray 3D. · All New Original Short: “Captain Sparky vs The Flying Saucers”—An exciting all-new short featuring Victor and Sparky’s home movie. · “Miniatures In Motion: Bringing ‘Frankenweenie’ To Life”—Viewers get an in-depth tour of the London set that includes never-before-seen footage showcasing the hundreds of artists who worked on the film. · “Frankenweenie” Touring Exhibit—Allows audiences to explore the artistry of the film’s puppets, sets and props in a showcase that’s traveling the world. · “Frankenweenie” Original Live Action Short—Burton’s original live-action short film. ‘The Tim Burton Collection’ Bluray is Coming May 1st!!! This entry was posted on Friday, November 30th, 2012 at 5:09 pm	and is filed under Film, News. You can follow any responses to this entry through the RSS 2.0 feed. You can skip to the end and leave a response. Pinging is currently not allowed.